I don’t spend a lot of time these days wondering why my personal taste in movies is so often completely out of sync with popular and critical opinion, but every now and then something comes up that makes me pause for a moment. On Friday, I went to see J.J. Abrams’ Super 8, even though I hated his wretched attempt to make a Star Trek movie; the whole period/kids-shooting-a-backyard-zombie-movie thing appealed to me, and I’d been a fan of Lost right up to the lousy final episode of the last season. Super 8 right now stands at 82% fresh on the Tomatometer, with an 85% positive audience rating, and the user rating on IMDb is currently 7.9. So there seems to be a pretty strong consensus that this is indeed the best summer movie in years. So why did it irritate me so much that I left the theatre the moment the credits started rolling, thus apparently missing the best part of the movie (the “actual” zombie film the kids were making)? As I walked home, I realized that the problem is a kind of creepy inauthenticity in Abrams’ work; that, in fact, he is some kind of pod person, capable of simulating human emotion without actually feeling or expressing it. As in Invasion of the Body Snatchers, he looks just like a regular person, he does what a regular person does, but there’s something crucial missing. Super 8 is made up of calculated borrowings from other movies, all carefully crafted and put together to resemble the things it’s imitating, but there’s no spark of life. So what we get is a carefully compiled set of cliches – the obnoxious fat kid? Check. The nerdy kid with braces? Check. The shy kid with an awakening crush on the tough girl? Check. The plot borrows from ET, from Close Encounters, from Goonies, even from the Abrams-produced Cloverfield, with the destructive alien turning out to be misunderstood and not really hostile at all; the government (in the form of the military) is evil; the two lead kids have to deal with a big family tragedy which has caused them to be isolated from their damaged single fathers (I guess this counts as “originality” – Spielberg usually has single moms). But don’t worry, the two families will be healed by their encounter with the alien (The Abyss, anyone?) and the whole thing will climax with a bizarrely overblown and incoherent battle scene which permits many things to get blown up before the final sentimental clinch as the movie ends with the same closing shot as executive producer Steven Spielberg’s ET and Close Encounters. Abrams is that nerdy kid who has a talent for completely disassembling some device to see how it works (in this case, the movies of his mentor Spielberg), but when he puts all the pieces back together again, it just won’t run. As overblown and manipulative as Spielberg’s work sometimes is, he does have a knack for almost naively connecting with the emotional life of his characters. 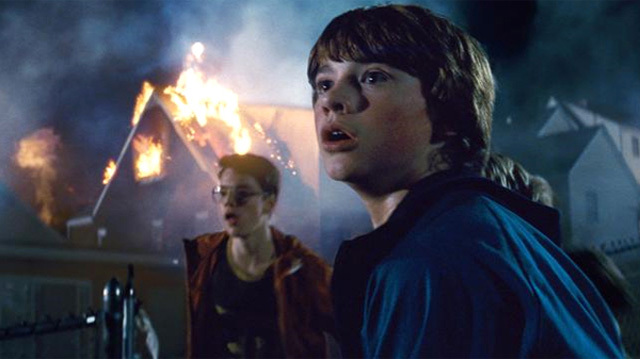 Super 8 exhausted me with its strenuous efforts to display genuine emotion within the flashy, effects-heavy kids’ action story, but it just lies there on the screen, an inert simulacrum, a cinematic corpse made from stitched together pieces of other people’s movies. This entry was posted in Review and tagged Blockbusters, Fantasy, J.J. Abrams, Review, Steven Spielberg. Bookmark the permalink.